IIEST Shibpur Cut off 2019: Indian Institute of Engineering Science and Technology, Bengal offers admission to candidates in the 4-year B.Tech course. Applicants who meet the IIEST Shibpur Cut off 2019 will be granted admission in the institute. The Cut off is the minimum marks required by an individual to get admission under various branches of B.Tech course. The institute provides 9 branches under which an aspirant can take admission. Candidates are advised to score equal to or above the Cut off of IIEST Shibpur 2019. Thus, it will increase the chances of getting admission. Admission is provided on the basis of JEE Main 2019 All India Rank. The concerned authority prepares the Cut off keeping in mind various determining factors. These factors are listed in the article below. IIEST 2019 Shibpur Cut off will vary according to different categories of candidates. Candidates who meet the Cut off will be called to attend the Counselling process which will be organized by JoSAA. As the admission authority has not yet released the IIEST Shibpur 2019 Cut off, therefore, applicants can take a look over the previous year’s Cut off. Aspirants will get an idea about their chances of admission and present year IIEST 2019 Cut off of Shibpur through the previous year’s Cut off. The Cutoffs for the year 2018 are given below in the article. 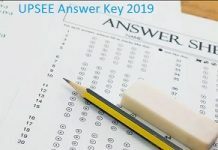 Total number of candidates applying for IIEST Admission 2019. Aspirants can refer to the Cut off of the year 2018 to get an idea regarding IIEST 2019 Shibpur Cut off. The Cut off was released in 7 rounds for different category of applicants and all the ranks mentioned in these rounds are All India Ranks. Joint Seat Allocation Authority (JoSAA) will organize the Counselling after releasing the IISET 2019 Shibpur Cut off. The counselling will comprise of several steps which must be followed by each and every shortlisted candidate. These steps include online registration, payment of counselling fees, choice filling, locking of filled choices, allotment of seats and verification of documents. Candidates have to report at the allotted counselling centres for getting their documents verified. Therefore, aspirants are advised to carry their original documents when reporting to the centres. Also, candidates have to pay an advance fee to confirm the seats allotted to them by the Indian Institute of Engineering Science and Technology, Bengal.